Cocaine Cowboys 2: Hustlin With the Godmother is a true crime documentary detailing the life of Charles Cosby and his relationship with the “Godmother” Griselda Blanco. It essentially plays out like a female fronted version of Scarface, what with the extravagant lifestyles, the love affairs and of course the ruthless killing. In fact in many places it seems like the sort of story produced especially for a slick Hollywood crime vehicle, considering how over the top it all seems. But no, director Billy Corben has brought us something that is most definitely real, as evidenced by all the research and evidence provided. Most of the film is narrated by Cosby himself, who recounts the numerous anecdotes in a laid back style. Cosby is more than aware of how crazy the story is at times, and seems to realise that the fact he is even around to tell this tale is a blessing to him. Cosby’s narration is backed up by many photos of him fondling cash, hanging out in expensive cars and engaging in hefty make out sessions with Blanco. In addition to this some of the tales he recounts are covered by crude animations, which takes the viewer away from the realism a bit. Cosby’s story is backed up with other tales from former associates and police officers who all have their own interesting little bits to add. Cocaine Cowboys 2 takes a much more personal angle than its prequel, which covered many notable figures in the Miami drug trade. As such the film banks itself on Cosby’s story being interesting enough and Cosby being someone the audience would want to listen to. While Cosby’s story is certainly quite interesting, it feels a little overstretched, and that it is Griselda Blanco that is the more compelling of the two. The other problem rests with the likability of the narrator. Sure Cosby’s confessional is entertaining and his story telling manner is decent, Cosby himself is a bad guy. He acknowledges the things he has done with little to no remorse for most of his actions. He professes to be out of the trade now but the fact remains that he was implicit in the Miami drug trade and the resulting murders that came with it. The fact that he received no punishment for his misdeeds may indeed make him a lucky guy as he says, but it also most certainly makes the main protagonist more of an antagonist. Qualms with the narrator aside, Cocaine Cowboys 2: Hustlin With the Godmother, is a fairly entertaining look at an extremely destructive relationship and the chaos that was sought during it. The disc also contains a couple of entertaining and informative special features, the main draw being a feature length commentary with the director Billy Corben and co-producer David Cypkin. The two men sit and discuss the film and some of the difficulties that presented themselves in the making of the film. The other feature is Hustlin’ With Charles Cosby: The Making of Cocaine Cowboys 2, which goes behind the scenes of the making of the picture and shows Corben at work. 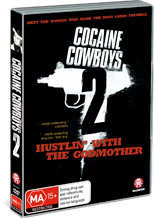 Cocaine Cowboys 2 is an interesting look at the drug trade of the 90’s, but its personal angle falters it a little. Cosby weaves many entertaining stories together but it is a little unsettling that at the end of the day this man committed so many crimes and received no punishment for it. Nevertheless it contains several interesting stories, and is a fairly effective character study of one of the drug trades most lethal and notorious figures.